There has recently been an upsurge in attention over the use of aromatherapy for Alzheimer’s disease. Several essential oils are proving effective for treating symptoms of dementia including anxiety, sleep problems, and even memory and cognitive function. Some recent findings: Lavender and lemon balm reduce anxiety and agitation. Peppermint can stimulate the appetite and support memory. Bergamot calms mood, fights depression, and aids sleep. Rosemary actually improves memory and cognition: there is clinical evidence for this! But I believe that research into the benefits of aromatherapy for Alzheimer’s is just beginning. “Aromatherapy” is a somewhat misleading term, since it is not necessarily the aroma of the oils used that creates the desired effect. Rather the oils have a direct effect on the body and brain, whether through contact with the lungs (breathing), or the skin (massage or body oils and lotions) or direct contact with areas in the brain. Aging and dementia can diminish the olfactory sense, but since a direct pharmacological effect of the oils is responsible for the healing effects, a diminished sense of smell should not be a concern when considering aromatherapy. 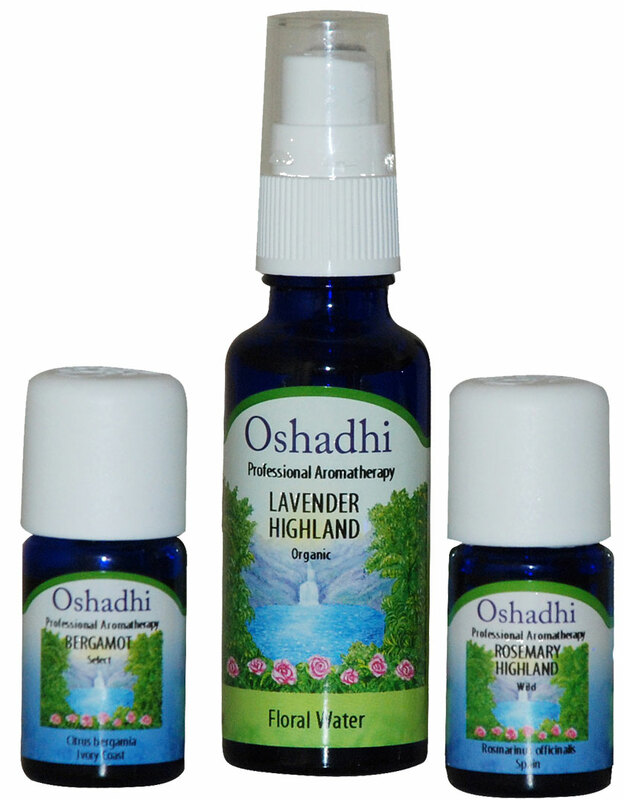 The Oshadhi oils in our store are among the best and purest available anywhere in the world. Impeccable care is taken in the growing, extracting, filling, and packing of these essential oils. All Oshadhi products are completely hand-crafted, from farm to bottling, without the use of electro-magnetic machinery to avoid disruption of their exquisite properties. We carry the oils that have been found specifically to provide effective aromatherapy for Alzheimer’s and dementia symptoms, but we have a full line of aromatherapy oils and products. Contact us if you are interested in products related to aromatherapy that you don’t see in our store, or for additional information to satisfy your curiosity; or if you want to share an experience you have had with aromatherapy for Alzheimer’s. We love to hear from our customers. Lavender – One of the essentials most used in studies of the effects of aromatherapy on AD. Traditionally, lavender is said to be calming and to balance strong emotions. It is also antidepressant and useful in cases of insomnia. Use it in the evening to promote better sleep, or any time of day to promote better mood. Lemon Balm – Another essential oil that has been studied in connection with Alzheimer’s disease and dementia, (Melissa officinalis) helps to calm and relax. It is helpful to those suffering from anxiety and insomnia. Melissa is probably the most studied of the essential oils for its affect on people who have Alzheimer’s disease, and it is very likely one of the most effective, but it is more costly than other oils that we offer. Peppermint – Used to both stimulate the mind and calm the nerves. It is said to rectify absent-mindedness; and studies show it improves memory. What could be better? Use it the morning to energize the patient and stimulate appetite. Rosemary – Stimulating and uplifting. Stimulates body and mind. A recent study by Mark Moss and Lorraine Oliver reported some compelling evidence that exposure to rosemary oil improves cognitive performance in both speed and accuracy measures.5 Furthermore, they found that higher concentrations of 1,8-cineole, the active part of rosemary essential oil, resulted in higher performance levels; this in addition to the improvement in mood they reported in the same study. Bergamot – Mood elevating, calming, and balancing. Relieves stress, anxiety, and mild depression. Refreshes. Relieves insomnia. Ylang Ylang – This oil can be relaxing and stress relieving, but at least one study has shown it can actually impair memory, so use with caution. There are others that can have some benefit to people with dementia, but these are the ones with the most clinical support. Other oils have general benefits. Effects that can improve anyone’s quality of life. Ginger (the oil as well as the spice and the fresh root), for example, is good for digestion and appetite. Oregano oil is anti-microbial, antibacterial, anti-parasitic, anti-viral, and anti-fungal. Many essential oils reduce inflammation including frankincense, chamomile, eucalyptus, thyme , and sandlewood. Read more about the possible connection between inflammation and Alzheimer’s disease here. And see our complete line of essential oils for Alzheimer’s and dementia. Essential oils are most commonly inhaled and absorbed into the linings of the lungs. They can also be applied directly to, and absorbed through, the skin. Care should be exercised when using and administering essential oils. Only diluted oils should be applied directly to the skin. Bath oils, facial oils, and skin care products containing essential oils are all appropriate for this purpose. Pure essential oils can also be diluted with carrier oils, also available on request. The Aroma-Ace, available in our store, is one of the best aromatherapy diffusers available anywhere. Essential oils are used in various ways. Inhalation is the most common and obvious: For this we offer several diffusers which disperse the oil into the air to be breathed. Sometimes the effects of the oils are more pronounced when they are absorbed through the skin³. Lavender is a good example. Massage a few drops into the hands before bedtime to promote sleep. Lotions and “carrier” oils that are infused with essential oils are also a comforting way to administer their benefits. A carrier oil can be any non-volatile oil derived from vegetarian sources. It is preferable to use an oil with a neutral aroma so as not to conflict with the essential oil. (“Neutral” does not necessarily mean the oil has no smell. Choose an oil with an agreeable, natural smell.) Many oils are good for the skin. We recommend organic, unrefined versions of coconut oil, jojoba oil, and sweet almond oil. There are others that work well, and non-organic versions can be used. Please stay away from anything that is refined or hydrogenated. Ambient Diffusion—Diffusers disperse essential oils into the air, either in a cool mist or by gently warming. Massage —Massage combines the therapeutic benefit of touch with those of essential oils. Massage relaxes and improves muscle tone, improves blood circulation and lymph flow, essential to the body’s immune response. Massage oil is 24 drops of essential oils (oils can be combined if desired) in 2 ounces of an organic carrier oil or unscented lotion. Body Oil—Best used after a shower or bath, body oils condition the skin, as they deliver aromatherapy treatment through skin absorption. Body oil can be prepared by mixing 6-10 drops of the desired essential oil in 2 ounces of an organic carrier oil, like Grapeseed or Sunflower oil. Bath—A good way to relieve muscular and emotional stress while soothing skin conditions. Use 8-10 drops in a full tub of warm water. Direct Inhalation—Put 2 or 3 drops of essential oil on a tissue and inhale through the nose. Pause, and repeat as desired. Foot Bath—2-4 drops of oil in a tub of water or a Massaging Foot Bath is a perfect way to soothe tired feet. Cool water is invigorating and energizing, warm water is relaxing. Soak feet for ten minutes and pat dry. Compress—Add 2-5 drops of oil to water (warm or cool) in a bowl or basin. Stir well, and soak a cloth in the water. Wring the infused cloth and apply to the skin. 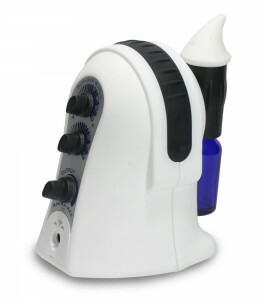 Misting is a convenient way to impart the aroma of an essential oil into the air. Add 20-30 drops of oil to 8 ounces of water in a mister bottle. Shake vigorously and mist the air. Body Lotion—add a few drops of oil to an unscented lotion. The use of essential oils has a history going back at least as far as the ancient Egyptians, who entombed their Pharaohs with jars of essential oils for use in the afterlife. The Chinese and Indians were probably the first to recognize the healing properties of the oils, and many cultures since those ancient times have used essentials for cosmetic and healing purposes. Aromatherapy is now getting an increasing amount of attention in the scientific and medical communities as an alternative therapy for people who have Alzheimer’s disease and other types of dementia. What they are finding is that certain essential oils have a positive effect on mood, behavior, and even on cognitive functioning and memory. The term aromatherapy was first used by René-Maurice Gattefossé, a French chemist who discovered, purely by accident, that lavender oil had a healing effect on burns. Since then, many have studied the healing effects of different essential plant oils. Aromatherapy is the use of volatile plant oils (essential oils) to improve psychological and physical health and prevent disease, and to affect mood. These oils are distilled from different parts of plants and contain the essence of the plant. Plants and herbs have a long and lustrous history in relation to our health. They have long been used for their healing properties, in herbal medicine, in our food, and as aromatherapy. Modern medicine has derived many of its most potent and important medicines from plants. If you, or the person for whom you are considering aromatherapy, is under the care of a physician, consult that physician before introducing essential oil therapy. If there is an allergic reaction to any essential oil, discontinue the use of that oil immediately. Every essential oil has its own unique properties. Precautions for particular oils are listed with that oil in the store. Following is a small sampling of recent research that has investigated the effects of aromatherapy for Alzheimer’s. Ballard CG1, O’Brien JT, Reichelt K, Perry EK; Aromatherapy as a safe and effective treatment for the management of agitation in severe dementia: the results of a double-blind, placebo-controlled trial with Melissa. J Clin Psychiatry;m2002 Jul;63(7):553-8. The study tested Melissa officinalis (lemon balm) extract against a placebo to determine its effect on patients with mild to moderate Alzheimer’s. The lemon balm improved cognitive functioning significantly better than the placebo.J Clin Psychiatry. 2002 Jul;63(7):553-8. Ballard CG1, O’Brien JT, Reichelt K, Perry EK. ; Aromatherapy as a safe and effective treatment for the management of agitation in severe dementia: the results of a double-blind, placebo-controlled trial with Melissa. J Altern Complement Med. 2004 Jun;10(3):431-7. Daiki JIMBO,1Yuki Kimura,Miyako Tamiguchi, Masashi Inoue and Katsuya Urakami; Effect of aromatherapy on patients with Alzheimer’s disease. Psychogeriatrics 2009; 9: 173–179. Mark Moss, Lorraine Oliver; Plasma 1,8-cineole correlates with cognitive performance following exposure to rosemary essential oil aroma.Therapeutic Advances in Psychopharmacology, 2012 Jun; 2(3): 103–113. How can Melissa oil helped with the Alzheimer’s? I did not see anything how it works. Thank you for the post. I read that aromatherapy is useful for senior people but I don’t know that it can help people with Alzheimer’s. I am really happy to get such kind of excellent article. Thank you very much for writing in detail about essential oils. Especially mentioning the first invention of this is really informative. Carry on with nice posting. Thanks so much for your nice comment. We’re really glad that you found our website. I was wondering if there is any report / study on the long term effectiveness and results of the aromatherapy on AD patients. Unfortunately not, Peter. Because of the progressive nature of Alzheimer’s, affects of any treatment are not very long term. The idea is to provide a better quality of life in the short run. I do not have Alzheimers yet but it is very prevalent in my family, would this work as a preventative? Could you please give the references of researches finding about Aromatherapy for Alzheimer disease . If you scroll through our Research Bibliography page (https://best-alzheimers-products.com/alzheimers-research.html) to the sections “Aromatherapy” (about 1/3 of the way down) you will find reference to most of the research we used to make our recommendations. This list is not exhaustive by any means, but is certainly a good beginning. https://www.ncbi.nlm.nih.gov/pubmed/20377818 – Effect of aromatherapy on patients with Alzheimer’s disease. what do you recommend for 61yr old male w EOAD. Has this person been recently diagnosed? If so, just keep doing whatever he likes to do. As the disease progresses, try and find “no fail” activities to keep him busy. Please call us if we can help you with anything. Hi Diane – Be careful about applying an undiluted essential oil directly to the skin. Some can be irritating, and some can cause sensitization. Irritation is an immediate reaction and the severity of the irritation results from several factors including the particular essential oil and the amount the skin is exposed to, as well as the individual effected. Different people and skin types react differently. Sensitization is more like an allergy that can develop and get worse over time with repeated exposure. If you want to apply an oil directly to the skin it is recommended that you first dilute it with a carrier oil or a good quality lotion. A good rule of thumb is 12 drops of oil per ounce of carrier oil. This yields about a 2% solution. A carrier oil can be almost any cold pressed vegetable, seed or nut oil. Olive oil, sesame oil (not the dark sesame oil often used in Asian cooking), hemp seed oil, and even coconut oil are some examples. Just be sure that whatever oil you select is pure (organic if possible) cold-pressed, and not rancid. We do not generally stock carrier oils, but we can get a variety on short notice. Good oil is always available at health food stores. More – The essential oils and blends that we list in our store have all been selected for their known benefits to people with dementia. Some of the oils are for cognition and memory, others are for behavior, sleep problems, and other issues that are often associated with dementia. The oils that have been studied most for their cognitive benefits are lemon balm (Melissa), lavender, and rosemary. alzheimer’s symptoms Hoping that aroma therapy may help. Glad to find your website. I’m very sorry for your struggles, and your wife’s. 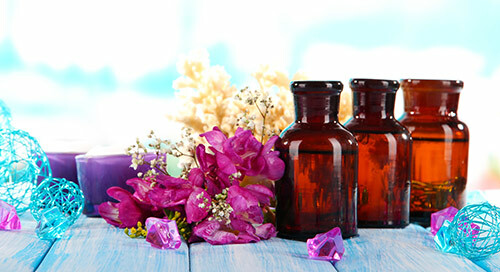 Many readers have had very good results with different aromatherapy products. Like everything else people will respond differently, but definitely give it a shot. If you need help with anything, let me know. We think of alternative therapy for Alzheimer's as any non-invasive treatment; that is, treatment that doesn't involve drugs or medication, or some surgical intervention or other medical procedure. Sometimes these alternatives work as well, or even better than the drugs that are often prescribed, and without the nasty side effects! *Be sure to consult with you medical professional. Doll therapy has been called a self-administering therapy. If a person accepts a doll, she or even he will benefit from nurturing the "baby", and this can be true whether the person thinks that the doll is a real baby, or knows that it is only a doll. A trained music therapist will create a context in which all the benefits of music therapy are possible, but knowing a little about why music is such a potent tool can help you create a therapeutic environment that includes music. In Shakespeare's Hamlet, Ophelia says, “There’s rosemary, that’s for remembrance." 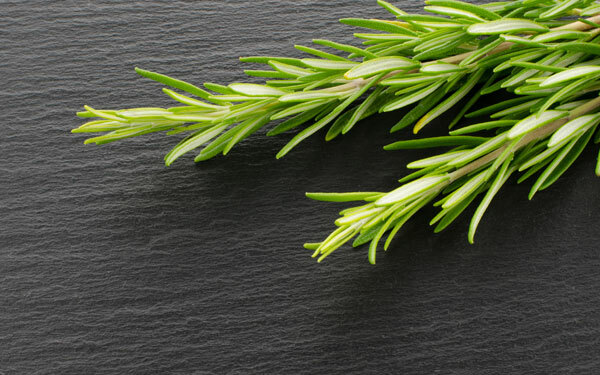 Recent studies show that rosemary, more specifically the essential oil of rosemary, has the power to improve memory. Other essential oils including lavender, lemon balm, and bergamot are also getting attention for the benefit that they provide to people who have dementia. Exposure to sunlight or to a bright full-spectrum light source is good for our brains and can help regulate our natural wake-sleep cycle. studies even indicate that cognitive deterioration slowed with regular exposure to bright light, and symptoms of depression decreased. We gather sensory information about our world with our noses as well as through our eyes and our ears. We taste with special nerve endings on our tongues, and other nerves allow us to feel with almost every part of our bodies. But it is the brain that processes those sensations. Sensory stimulation is brain stimulation.